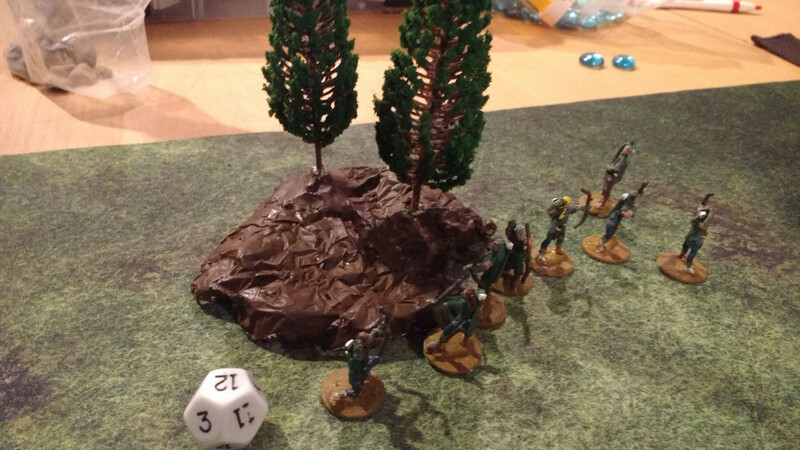 Once you have a lot of (more or less) nicely painted minis, dice and counters, and a decimated forest of rulebooks, it’s time to get some terrain. Of course you could just use whatever junk you have lying around, but after a while you tend to want something that looks realistic. This is the stage I’m at — sick of using random books and stuffed animals as hills and buildings. I do have one slight problem, though. I’m poor. And cheap. This was driven home when I looked online for some nice terrain. Single, unpainted and unassembled pieces alone went for tens of dollars! Entire sets can set me back hundreds of dollars! Gasp! This was out of my admittingly minuscule price range. I was tired of having crummy unrealistic terrain, yet I didn’t want to shell out the money to get something nice. So, what’s a wargamer to do? Enter the internet again as my savior! There are a bazillion guides on DIY terrain — you can pretty much build terrain out of any junk lying around. I saw terrain out of old soup cans, pop cans, straws, and coffee lids to name a few. Although I appreciate the creativity, I wanted more control over the dimensions of each piece. A painted soup can is what it is. You can add stuff to it but you really can’t change the height or diameter. If you look closely, you can still tell it was a soup can just with a nice coat of paint. I eventually narrowed my choices to foamboard and plaster. Foamboard was looking like a winner — the example houses and hills looked spectacular. However, the more I looked into it the more disappointed I became. My first point of contention was cost. It’s not super expensive, but still out of my small price range. The interwebs recommended you get a cutting iron, hot glue gun, and hot glue. Again each aren’t super expensive but still an expense I didn’t want to deal with. I also wasn’t keen on the fact that hot-cut foam would release toxic fumes. Enter plaster. 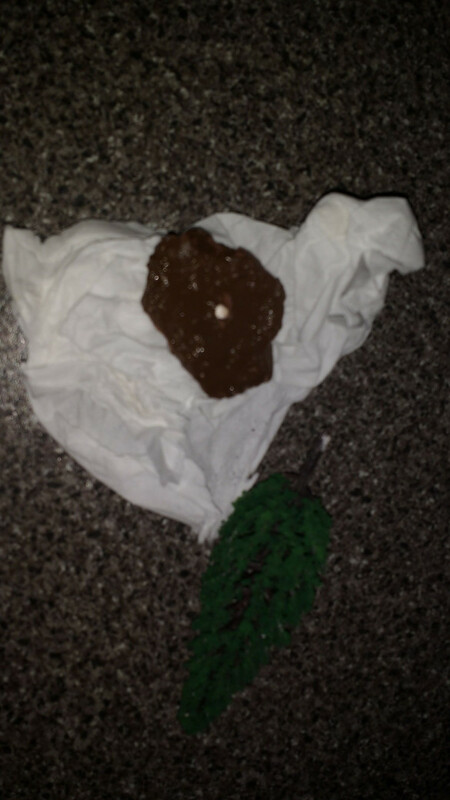 It was cheap and relatively not toxic (I wouldn’t make a milkshake out of it, though). 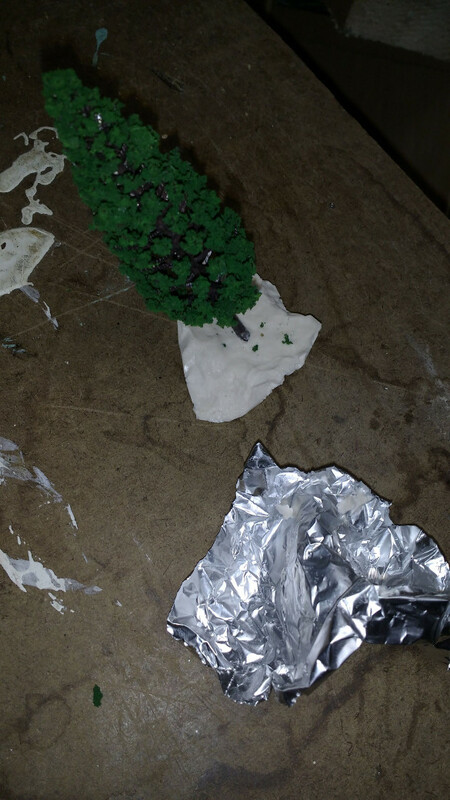 I already had some cheap trees, large washers, and I stole some aluminum foil from my wife. 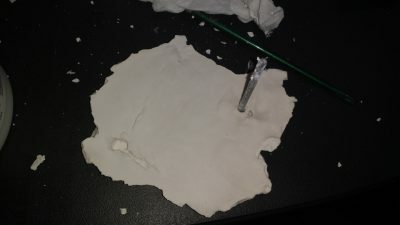 The plaster was my only real cost, which was about $13 on Target.com (Bonus fact: Target also exists in Australia with the same branding but is a totally different company. I’m speaking here about the USA Target. If you’re down under, I can’t guarantee you’ll find plaster there). 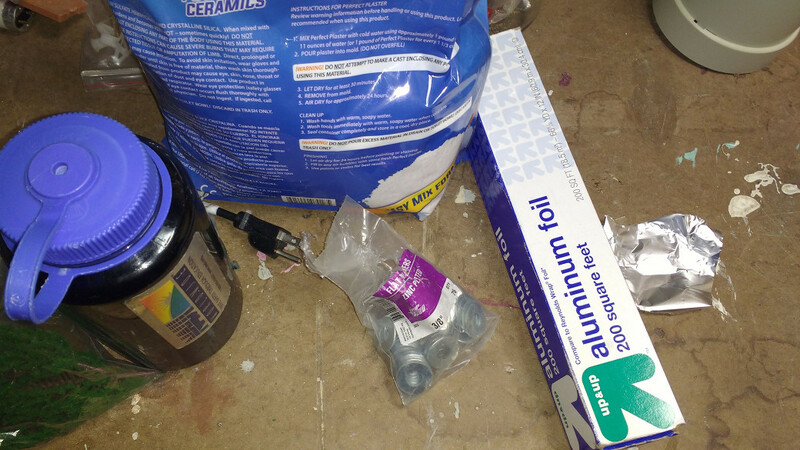 For my first test, I made a cup out of aluminum foil, placed a washer at the bottom, and dumped in a little of the powder plaster. Taking some water, I poured it over the evil white mixture until it was soupy. 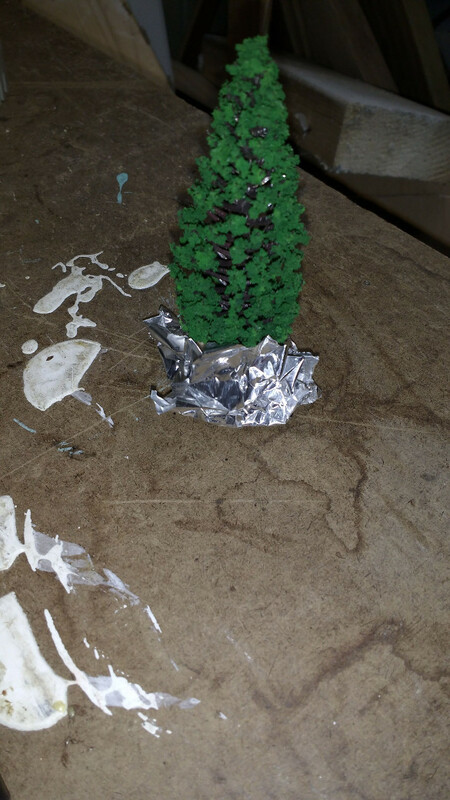 I then placed a tree in the white goop, folding up the foil so it supported the tree while it dried. You can see how the base came out a little misshapen. Fortunately, plaster can be broken with a fair amount of force. I just chipped away at the base until it looked OK.
After I was satisfied with the result, I painted the base with some paint, also from Target. I could have used my nice Vallejo but I didn’t want to waste expensive paint on mere terrain. Judge away on my wargaming snobiness. 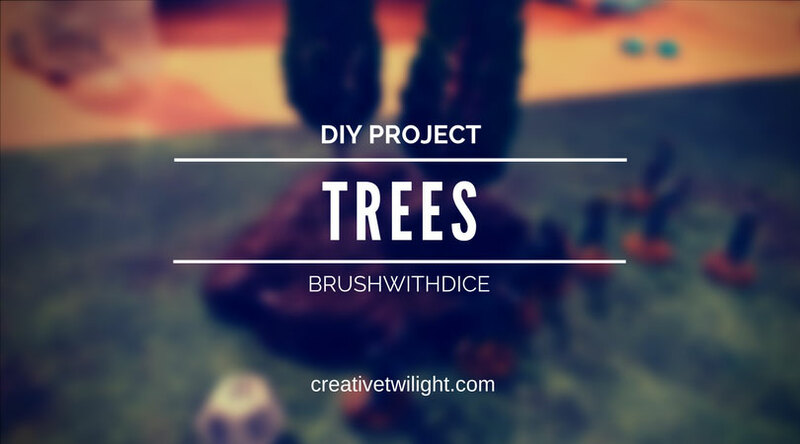 Satisfied with doing just a tree, I wanted to do something bigger. I used an old Tupperware container and crumbled up some aluminum foil for a mold. I did go a bit overboard and I couldn’t unravel the foil ball without breaking it. Rolling up another sheet with a bit less enthusiasm, I created a crinkled surface that would reflect the rough terrain of a small hill. 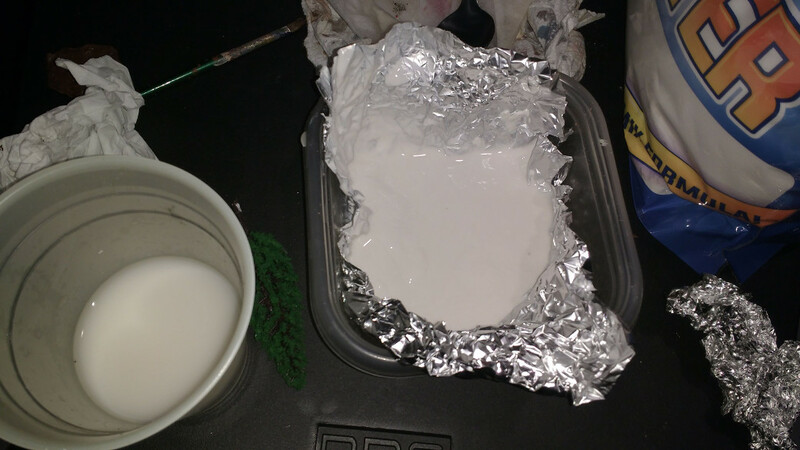 Putting the foil in my container, I put in about eight plastic spoonfuls of plaster and enough water to make a soupy mess. I can’t really say how much I put in since I didn’t want to use any of the wife’s nice measuring spoons. Although plaster is not really toxic it wasn’t something I wanted to mess with. In the second picture you can see a nail that I stuck into the plaster. My thought here was that I can pull out the nail and have a nice hole for a tree. My fear was that if I drilled into the plaster it would crack and break. Finally, when it was dry I glued a tree in the hole with the nail. I just used some good ol’PVA glue. The nail came out OK, although I feared I would crack the plaster the entire time. 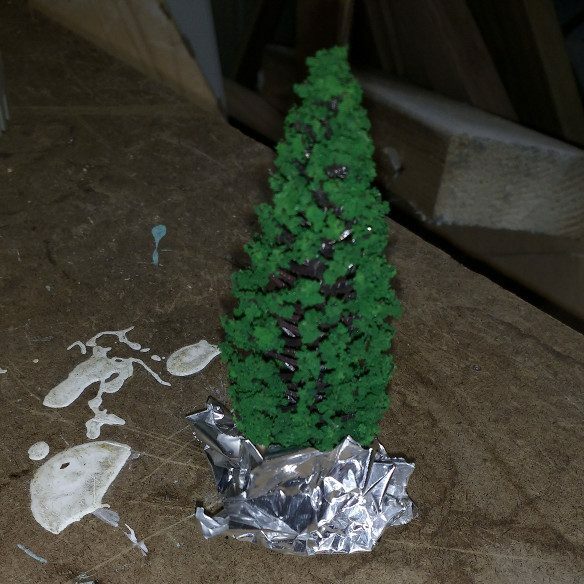 The other tree is held up with some wall filler. 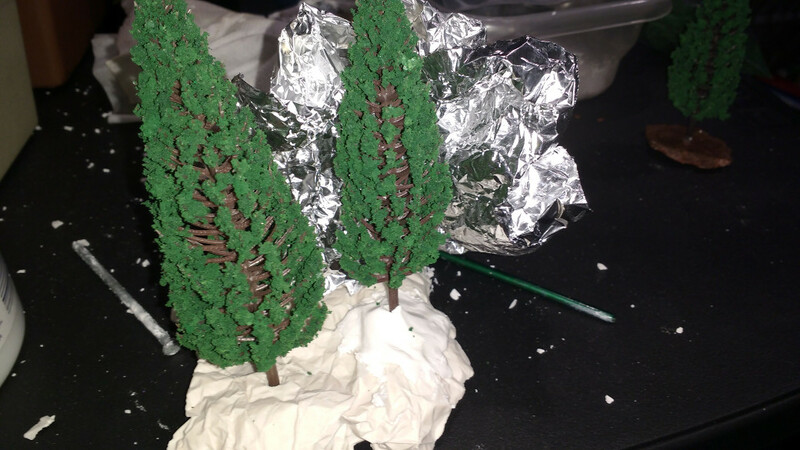 The second tree was kind of a last minute thing, and I just created a little filler pyramid and shoved the tree in. Some more of the same cheap paint later and you can see it turned out pretty good. If I felt more motivated, I would probably used some wash and dry brush on the raised areas. Maybe even glue some rocks or flock on top. All in all using the plaster was a good experience. I am certainly going to do it again. There were some drawbacks, though. One thing I didn’t account for is how messy it can be — like glitter, the powder gets everywhere on your workspace. Plaster isn’t the strongest stuff in the world either. If you drop this on a hard floor, it will shatter. Shatter into a lot of annoying white pieces, that is. Also, DO NOT POUR LIQUID PLASTER DOWN THE DRAIN! Seriously, don’t. If you do it will harden in your pipes and your local plumbers will dance in the streets at their newfound good fortune. I didn’t make this mistake but warnings abound on the package. I give it two plaster-powder covered thumbs up. If you can tolerate the drawbacks and don’t pour it down your drains, it allows for great amount of creative flexibility at a reasonable price. Very clever idea; I like it. The nail hole is great too because it will make storing the terrain easier, and less likely to snap the tree off as well. As you said, some simple dry brushing, and some flock would step this up. Also, adding in some some sand as well would be a nice touch – give some variation on there. As a DIY fan, I’ve really appreciated the spirit behind this post. The aluminium foil cup trick must be stolen. Nice work! If you luck into a copy of it, there’s an old GW book called How to Make Wargames Terrain that has some fantastic ideas along these lines. There are two editions, both are good, but the earlier (with the red cover) is better for this sort of super budget work.